Photo. Turtle excluder devices help turtles . . . and the fishing industry. 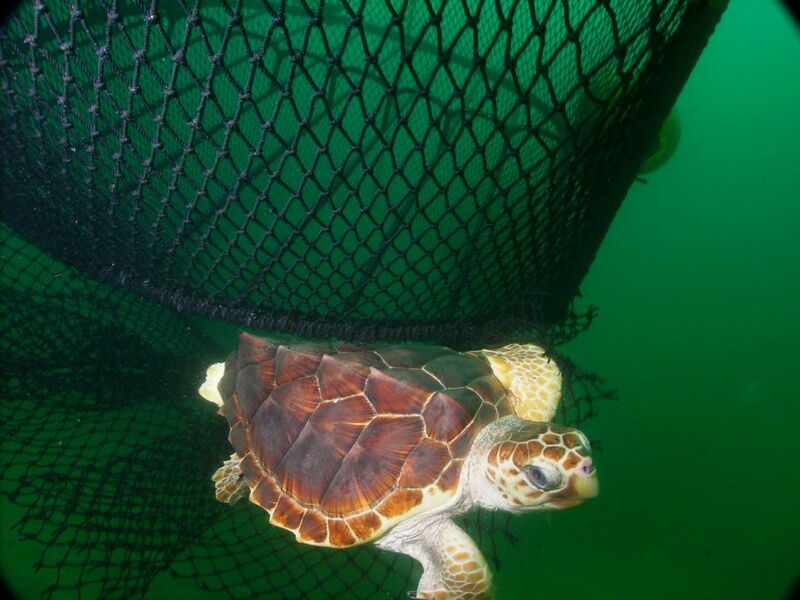 A loggerhead turtle escapes a fishing net equipped with a Turtle Excluder Device (TED). Prior to TEDs, an estimated 44,000 loggerheads died each year in commercial fishing gear in the Northwest Atlantic and Gulf of Mexico, more than ten times current numbers. Turtle excluder devices (TEDs) are tools originally developed by fishermen that benefit both the commercial fishing industry and the marine environment. In the 1970s and 1980s, American shrimp fishermen invented various TEDs to reduce their bycatch. The shrimp fishery uses large trawl nets that skim the seafloor. The nets' mesh is fine enough that shrimp are caught as the net drags along the bottom. TEDs have a fairly simple design: a grid of bars is attached to the top or bottom of a trawl net. (The bars are visible behind the mesh directly above the loggerhead in the photograph.) Small animals, such as shrimp, pass right through the bars and into a bag-like net. Animals that are too large to pass through the bars are ejected through an opening below them. TEDs not only benefit turtles, but also allow other large animals, such as sharks and rays, to escape. (turtle excluder device) tool attached to a trawl net to allow turtles and other large animals or objects to escape. to fish by dragging a large net along the bottom of the body of water.